If you’re looking for a favor that isn’t so traditional or bland, you’ll want to take a peek at our list below. From treats to bits you may have never thought to compile for your family and friends before, there’s something to pique everyone’s interest below. Scroll through our 10 unconventional wedding keepsakes your guests will love and tell us which is your favorite of the bunch! We’ve seen these cuties floating around all kinds of events and we think they’re perfect for your guests. They’ll be able to enjoy the chocolate inside (which you can customize at placed like WH Candy) and then keep the wrapper for a scrapbook! And this is so much fun to do. From deciding on the flavor, which can be anything from traditional milk, white, or dark chocolate to gourmet infused such as cookie dough or pretzel peanut butter additions. Then on to designing the wrapper, it’ll be an engaging chore to take on for you and your beau. After a night of celebrating, why not gift your guests with a sleep mask they can use as soon as they hop into bed that night? It’s a luxury to have and completely unique. You can take this on as a DIY project or find a vendor with a design you love – maybe even one that coincides with your theme. Whether you want this done with leftover flowers throughout an extravagant celebration (you can hire people to make this happen while the reception unwinds – starting with the ceremony space and moving to the reception throughout the event) or you can shell out a bit extra to create mini ones on the side to have your guests leave with. How special do you think your besties and cousins will feel leaving with their very own piece of the party? Fresh fruit is always a great way to go as well. And the presentation is key. Go with seasonal bites to pay homage to the time of year – and dress them in a carton that guests can grab and go with. They can use them to snack on throughout the week or jazz up a recipe with. It’s a beautiful nod for those that want a very natural, organic feel to their wedding. One of the most unique on the list, an incense bar at your wedding will really wow your guests! They can grab some of their favorite scents and take them home to fill up their own space with fragrant memories. Lavender, eucalyptus, and rose are just a few of our personal favorite. You can even make sure the scents offered at the table reflect the season! 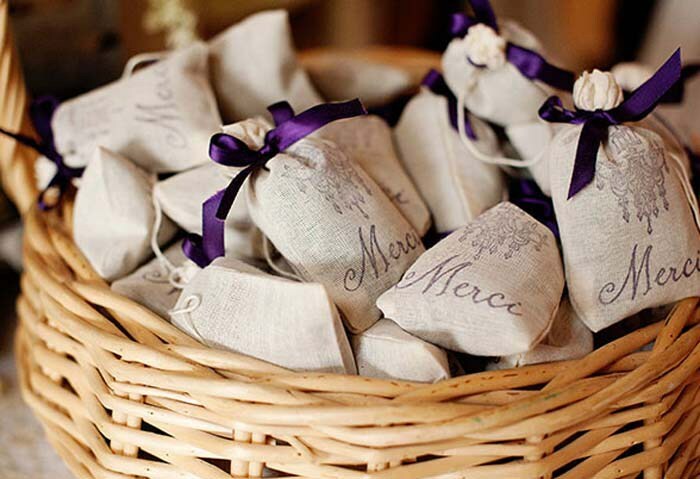 This may seem like a more obvious choice, but they’re rarely used as wedding favors! There are multiple places you can create your own and customize to your liking – check out Etsy for a large variety of designs to inspire. Keep the party going even after your guests leave by providing them with a tiny bottle of champagne they can pop after they get home! Note: You just have to triple check that no one underage leaves with their own bottle. We suggest providing a kid/young adult choice to go along with this option – think sparkling grape juice or Coca-cola bottles. After hours of dancing, your loved ones may be craving a snack or two. Whether you want to go with cookies and milk to hit that sweet tooth or maybe something savory like a bag of fries – these late-night snacks will put smiles on everyone’s faces. Here’s another scent-sational keepsake idea for your guests. Offer up some fragrant potpourri that they can utilize and disperse at home. Make sure the aroma is of seasonal flavoring and that you present it in a dainty box or fun cloth bag. If you’re really crafty, you can DIY this too. Just check out this recipe from HGTV for fall! Not only is Himalayan salt beautiful to look at – so it’ll set the scene nicely – this is truly a favor that your guests can use for days – months to come! Every time they need a pinch of this or that, they’ll remember your day and all of the great memories. A dash on some potatoes or a bit on some garlic bread will go a long way.